With a stainless steel bracelet and compact case, the Française is the sportiest version of the Cartier Tank. The collection's highlight is the bicolor Chronograph Tank Française Chronoflex, which is especially precise thanks to its quartz movement. Louis Cartier first designed the Tank in 1917. Over the years, this timepiece would become a true classic. Many famous people have fallen for the Tank's timeless design, including artists, actors, and royalty. 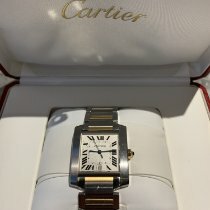 As its name, rectangular case, and elongated lugs suggest, Cartier drew inspiration from the tanks used in the First World War when designing this timepiece. Tempered hands and Roman numerals characterize the series. Every version of the Tank sticks to this same basic design, and the Tank Française from 1996 is no exception. Even so, the Française is still sportier than its classic and elegant sister models such as the Tank Louis Cartier and the Tank Américaine. Current models come on bracelets made of stainless steel or gold. The more compact, almost square case has its roots in French architectural history and sets this timepiece apart from the other Tank models. The Française is available in stainless steel, yellow gold, or white gold. There are also bicolor models that combine steel with yellow or pink gold. 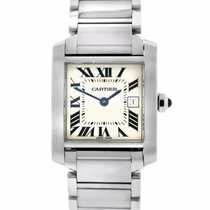 Both quartz and automatic calibers appear in these luxury Cartier watches. In terms of size, Cartier distinguishes between small (25.2 x 20.3 mm), medium (30.4 x 25.05 mm), and large (36.5 x 28.15 mm). While those with larger wrists may gravitate toward the large models, all three sizes look great on smaller wrists. How much does a Tank Française cost? In addition to many mint-condition timepieces, you will discover a vast pre-owned market when searching for a Tank Française. This is because these models have been in constant production since 1996. Stainless steel watches in very good condition cost around 1,800 USD. 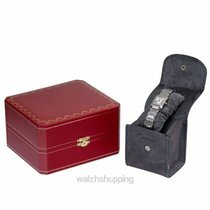 Most of these timepieces have small or medium cases and are quartz powered. A similar Tank Française with an automatic movement demands around 2,300 USD. Every Française with a mechanical caliber also has a date display at 6 o'clock. The bicolor versions in steel and gold are particularly attractive. The interplay between the steel case and the gold crown with a blue spinel only enhances the elegance of these watches. Fittingly, the bracelets are also made up of steel and gold elements. 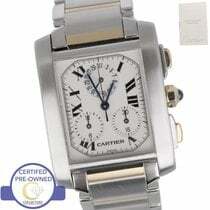 A well-maintained Cartier Tank Française Bicolor with a quartz movement costs about 2,300 USD. Those with an automatic movement sell for around 4,100 USD. You can purchase a small Tank Française with a gold case and bracelet for around 7,000 USD in very good condition. Yellow gold models with diamonds on the case and bracelet change hands for about 21,000 USD. Depending on its condition, a white gold model with diamonds can cost anywhere from 9,400 to 38,600 USD. If you want a mechanical gold Cartier watch, but can do without a gold bracelet, plan to spend around 4,700 USD. These models are worn on cow or alligator leather straps, which come in a variety of colors. The bicolor version of the Tank Française Chronoflex is especially popular and costs about 3,500 USD. The crown and push-pieces are yellow gold. 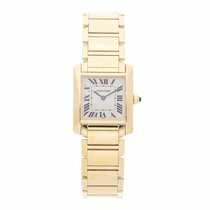 The subdials sit at 4, 8, and 12 o'clock, and the "Cartier" inscription is located at 6 o'clock. Unlike the two-hand models, the Chronoflex's minute scale is shaped like an octagon and encompasses the Roman numerals. Overall, this chronograph feels harmonious and balanced. In stainless steel, the Tank Française Chronoflex costs about the same as the bicolor model. For a timepiece with a gold case and leather stap, be sure to set aside around 5,900 USD. Paired with a gold bracelet, prices for this chronograph rise to around 11,700 USD.